Have you ever had the terrible experience of mixing a dark towel with whites? The result was likely a spotty-looking towel that had to be turned into a rag or thrown away. That’s not a good use of your resources. Now, you can be sure your investment won’t be destroyed by laundry mishaps. 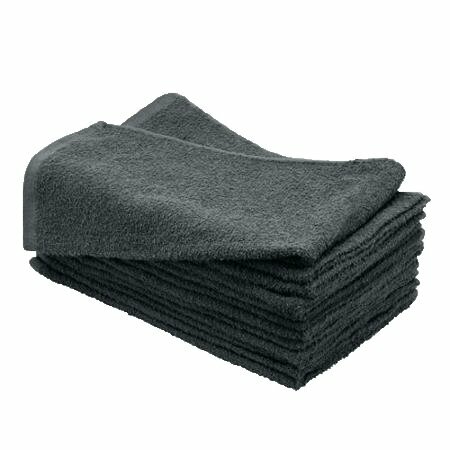 Introducing our Towel Super Center bleach-resistant hand towel in charcoal. Don’t let the color fool you: these towels can resist bleaching products. They’re specially constructed to resist bleach, so you don’t have to worry. Order units of one dozen charcoal bleach-resistant hand towels from us today. We’ll have them shipped right to your door, and you can use them immediately. You Can Always Find a Use for a Bleach Resistant Hand Towel! In the master bathroom to make cleaning your hands and face much faster. In the powder room to give guests and family members a thirsty towel to dry their hands. In the pool area for a quick wipe-off after a cool dip or to remove excess sunblock or lotions. In the garage or shed to keep your family handyman’s hands cleaner. In the home gym to combat all the perspiration. In the front closet or mudroom for quick wipe-ups after being outside in the snow, rain or mud. In the kitchen as a backup for your dish towels. In the pet’s area for fast clean-up of accidents. In the nursery for baby diaper changes and to clean up spills. Keep in mind that although these are hand towels, you can use them wherever and whenever you need a 16” x 28” towel. Plus, because they’re made from cotton, they’re quite gentle on sensitive skin. Everyone in your household will appreciate having towels when they need them the most. Purchase your charcoal bath towels from Towel Super Center with confidence. You’ll always get wholesale and discounted prices for all the towels you need to keep your home humming. Love this color and great price. Works well for our salon.